"The bigger the lie, the more they believe." When David Simon and Ed Burns developed the first season of The Wire, they presumed the Baltimore series wouldn't even get a second season. The intricate, lengthy storylines and massive group of characters would never going to resonate with a mainstream audience. Viewers accustomed to the tidy conclusions of mundane shows from the Law and Order and CSI franchises would grow anxious when arcs weren't resolved properly. Few expected this remarkable drama to actually run for five seasons. During each collection of episodes, the stories focus on a pivotal issue and often implicate the audience for our disinterest in solving the problems. The first four installments covered the drug trade, the decline of the ports and unions, reform, and the sad state of the school system. Characters are woven throughout the entire series, which tackles a much broader scope than just each year's primary issues. The Wire's fifth season tackles the decline (and misuses) of the journalism field, particularly the newspaper business. While continuing to cover Baltimore's cops, criminals and bureaucrats, the plot also focuses on the inner workings of the Baltimore Sun paper. The Internet�s free access to information and the large corporation's focus on efficiency creates a culture where reporting the news is not the primary focus. The managing editors keep their eyes set on winning a Pulitzer, while the underlings must "do more with less." This corporate model conflicts directly with the role of a newspaper, and the result is chaos. The heart of old-school journalism is represented here by City Editor Gus Haynes (Clark Johnson, Homicide: Life on the Street), who realizes that the rules don't really apply anymore. Johnson plays this role perfectly and makes Gus a believable, idealistic presence. While Gus' evidence of a colleague's possible fabrications goes on deaf ears, we see the impending destruction of our media system. This description may sound depressing, but it's actually invigorating to watch intelligent characters that care about the business. The writers deftly involve the paper in the ongoing plotlines while presenting the frustrations encountered by reporters and editors across the country. Following ongoing threads, we continue to follow the dramatic twists and turns of the drug trade and its wide array of players. The cold, brutal Marlo Stanfield (Jamie Hector) continues to grab territories while he learns from the old-school Proposition Joe (Robert F. Stewart). Supported by the "muscle" of Chris (Gbenga Akinnagbe) and Snoop (Felicia Pearson), Marlo asserts his authority in the streets. Other familiar figures remain pivotal, including Slim Charles (Anwan Glover) and fan favorite Omar Little (Michael K. Williams). Simon, Burns and the writing staff deserve tremendous credit for presenting both the intelligence and the violence displayed by the dealers. Functioning like a major corporation, the trade requires sharp ingenuity and huge guts for success. Even the nastiest figures are believable and never stray into the realm of fantasy. Many are based on real people and are thrilling even when they move way across the line. These are not the typical "thugs" you might see in a lame Hollywood gang picture. The stakes are extremely high, and even the possibility of deception can lead to the end. Another major arc involves the drastic budget cuts on the police initiated by the once-idealistic Mayor Tommy Carcetti (Aiden Gillen). Facing a serious lack of funds for the schools, he takes money from the police to save face publicly. This belt-tightening kills the investigation of Marlo and seriously irritates the assigned detectives. Jimmy McNulty (Dominic West), Lester Freeman (Clarke Peters), Bunk Moreland (Wendell Pearce) and others return to basic duty with a serious chip on their shoulders. This frustration leads to one of the series' most controversial decisions. I won�t reveal anything here, but will say that it's a stunning turn even for this show. It still amazes me to think of the journey for several revered characters. The ramifications of the choice will go far beyond the original people involved in the deception. This plot twist could be dismissed as uncharacteristic for the series, but it actually makes complete sense. The writers have always shown how each action can have a dramatic effect of entire system. By presenting the high-level bureaucrats, street cops and minor drug players intelligently, we observe the stunning connections between each level of power. Although the reviews are strong, the fifth season is generally regarded as the least effective by the show's devoted fans. This is some truth to their assessment, but the problem largely falls with the shorter episode run. While previous installments had lasted either 12 or 13 episodes, this collection includes only 10 entries. The missing few hours would have added extra depth that would have better explained characters� actions. While it remains top-notch drama, the slight drop-off mostly falls on the shorter running time. The expectations were also monstrous for the final year and grew higher as media attention increased. The fourth season is one of television�s best stories, and it would be nearly impossible to replicate that success. This collection's accelerated pace and controversial moments made it a tougher sell than its superb predecessor. The Wire has received tremendous acclaim during its five-year run, but the high praise still can�t match its unique status as a cultural landmark. A television show has never presented the complex mechanizations of our society in such riveting fashion. On the surface, the intellectual subject matter sounds like a stuffy documentary, but that idea is completely untrue. The intricate episodes are fascinating tales and give us hope for even the rough criminals. There are far too many classic figures and scenes to mention in this review. I could write a long essay solely about the ups and downs of Bubbles' (Andre Royo) struggle with drug addiction. The fact that Royo has never received an Emmy nomination reveals the pointless nature of those awards. Other personal favorites include the cool Slim Charles, brilliant Lester Freeman, honest mayor's aide Norman Wilson (Reg. E. Cathey) and Felicia Pearson�s nasty killer Snoop. I could list another 15 characters and would still have room for even more. This fact showcases the remarkable depth of the finest television series ever created. Image Transfer Review: This final DVD release of The Wire uses its original 1.33:1 transfer and offers a fairly grainy image. However, the full-frame look contributes to the series' realistic, gritty environment. Although it's not pristine, the transfer is sharp enough to deliver a gripping experience. The picture never distracts from the story and remains consistent throughout the season. Audio Transfer Review: A slight improvement comes from this set's 5.1-channel Dolby Digital transfer, which nicely presents the sounds of the streets, the newspaper office and the police department. It's not a booming track, but there is good volume as gunshots blare and tunes spring from car radios. You won't use this audio to impress friends, but will enjoy more expansive sound than in the original airing. The remaining features include two half-hour documentaries that aired on HBO prior to the start of the fifth season. 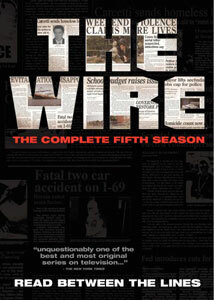 The Wire: The Last Word discusses the media's current role and how it�s portrayed on the series. Professionals like Slate.com's Jacob Weisberg and the Washington Post's Steve Luxemberg describe the lack of objectivity in the business and a growing disconnect between journalists at the paper and the home office. The Wire Odyssey gives an overview of the past four seasons and includes lots of praise for the show. We hear plenty about "keeping it real" and how it's affecting society. Other areas covered include favorite scenes, characters and cast auditions. These features are entertaining and worth viewing once, but they were designed to be promotional fodder for HBO. That means we don't hear about the major decisions involved with creating the final episodes. I'm disappointed to miss this chance; however, these choices are covered during the commentaries. The Wire's reputation should only grow stronger as word of mouth spreads about this incredible achievement. I would have liked to see a more substantial documentary, though it's hard to complain about six memorable commentaries. The fifth season might not be the series' best, but the final 10 episodes retain the high quality and offer a fitting end to a classic drama.